The latest indication of wildlife recovery in Gabon is a solitary male lion captured on a remote video camera that was set up to study chimpanzees. Nobody knows how he got there, or why he’s chosen the forest as his home. Twelve years ago, biologist Philipp Henschel trekked 300 kilometers through the savannas and forests of southern Gabon searching for signs that its once abundant lion population remained. He found none. Last month, those signs came to him. A colleague at Gabon’s national park agency called Henschel on the phone with an intriguing request: He had some grainy images from a remote video camera set up to study chimpanzees. Could Henschel come to his office and take a look at them? "He seems to have adapted to a life in the forest. But how an animal that size hunts in the forest we don’t know yet." Henschel is now the lion survey project coordinator for Panthera, a global wildcat conservation organization. Since last month’s discovery, his group, along with the Max Planck Institute for Evolutionary Anthropology’s Pan Africa Programme and the Aspinall Foundation, have repeatedly captured clear video footage of a male lion walking down a forest path in Gabon’s Batéké Plateau National Park—an ecological wonder for more reasons than one. Until recently, lions roamed throughout the plateau, a mosaic of forest and grassland spanning 200,000 square kilometers across southern Gabon, Congo, and the Democratic Republic of the Congo. 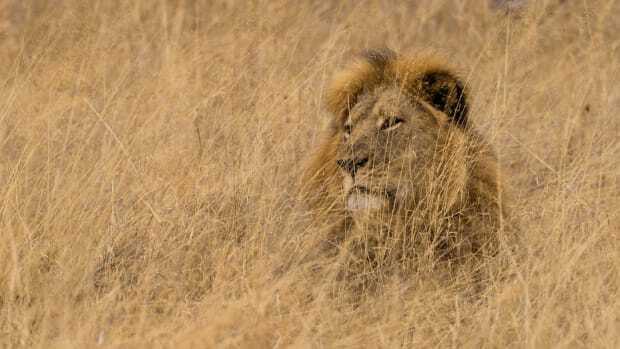 But the last confirmed lion sighting in Gabon occurred in 1995. 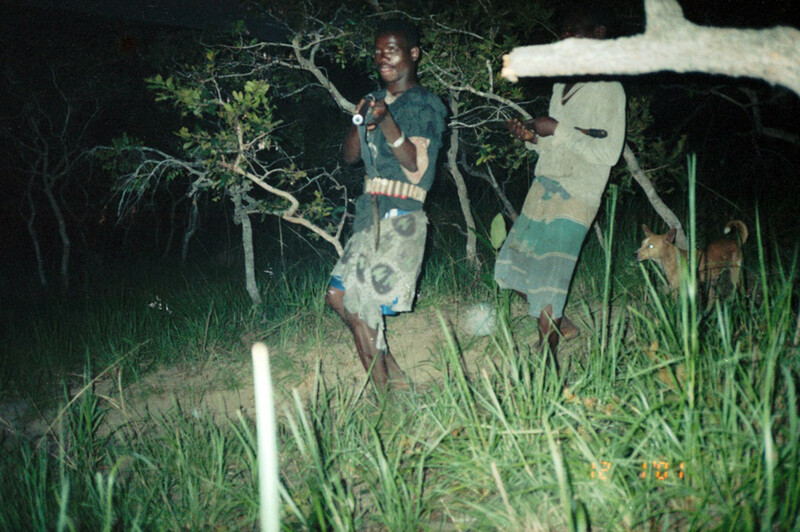 And when Henschel surveyed the area in 2001 and 2003 as part of a government-wide evaluation, he found more signs of poachers than of wildlife. Even more confounding is the ecosystem itself. The Batéké Plateau is ecologically isolated, surrounded by the Congo Basin’s extensive tropical rainforest—unlikely habitat for savannah-loving lions. No one’s sure how lions got there in the first place, according to Henschel. They probably arrived about 18,000 years ago, when ice sheets covered much of the northern hemisphere and the climate in West Africa was drier, the grasslands more extensive, and the rainforest more contained. Historic and genetic evidence suggests that as the rainforest retreated, lions and a handful of other savannah species moved up from the south. But many savannah species—zebras, wildebeest, giraffe—either never made the trek or didn’t persist on the plateau. With limited food options, Gabon’s lions fed mostly on forest buffalo. After Gabon’s independence from France in 1960, citizens armed with shotguns did as well. As hunters wiped out buffalo, hungry lions turned to cattle, and angry ranchers poisoned them. 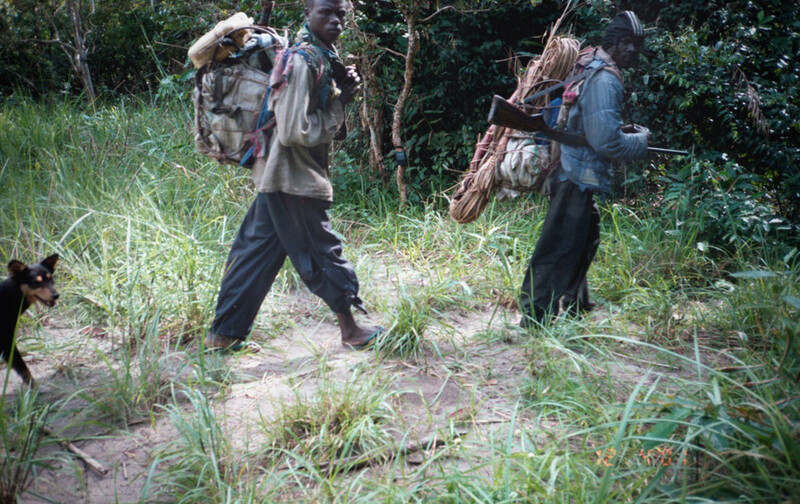 Civil war in neighboring Congo at the end of the 20th century sent Congolese hunters streaming across the border into Gabon in search of food, further depleting prey. By the start of the 21st century, the lions of Gabon were locally extinct. 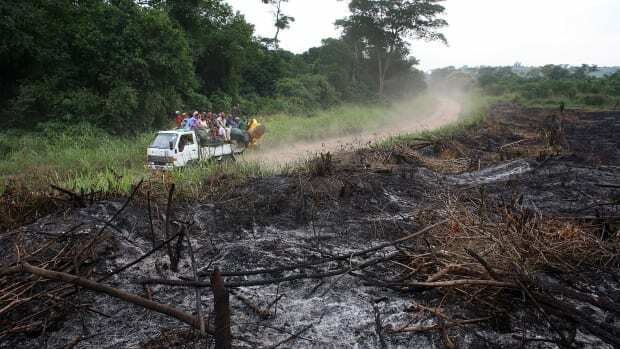 Today, lowland rainforest stretches 1,000 kilometers to the north of the plateau, separating it from small lion populations in Cameroon and the Central African Republic. To the south, the Congo River separates Gabon from the few remaining lions in the Democratic Republic of the Congo. Both the dense rainforest and the deep river are formidable obstacles for lions seeking new territory. But that’s exactly what Henschel thinks this lion was doing. Young lions often leave their natal home in search of new territory and mates, roaming hundreds of kilometers if necessary. Henschel believes this lion most likely swam across the Congo River from the Malebo region of the Democratic Republic of the Congo, 250 kilometers away; an area where other biologists have spotted lions in recent years. Yet the amount of wildlife in the park remains low, and lion populations throughout Africa are in trouble—not just in the unusual mosaic of the Batéké Plateau, but in the iconic Serengeti of East Africa as well. The International Union for the Conservation of Nature lists the African lion as a vulnerable species. It estimated in 2012 that Africa’s lion population had decreased by at least 30 percent over the last 20 years, largely because of declines in natural prey and corresponding conflicts over livestock. Those figures were based on studies conducted a decade ago, and some conservation groups believe lions number as few as 20,000 continent wide, down from 450,000 as recently as 1940. The greatest challenge in Gabon now could be finding a female lion. “We’re hoping that natural re-colonization will occur,” Henschel says. But females don’t migrate long distances like males do. “We might need to reintroduce a female,” he says. 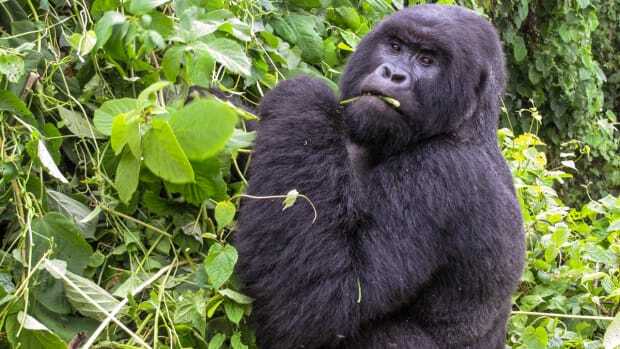 “But that’s invasive and we don’t even know what subspecies this is yet. We don’t want to crossbreed.” Henschel’s current survey will include DNA analysis of feces and fur, as well as camera traps to document the presence of individual lions and trace their origin. 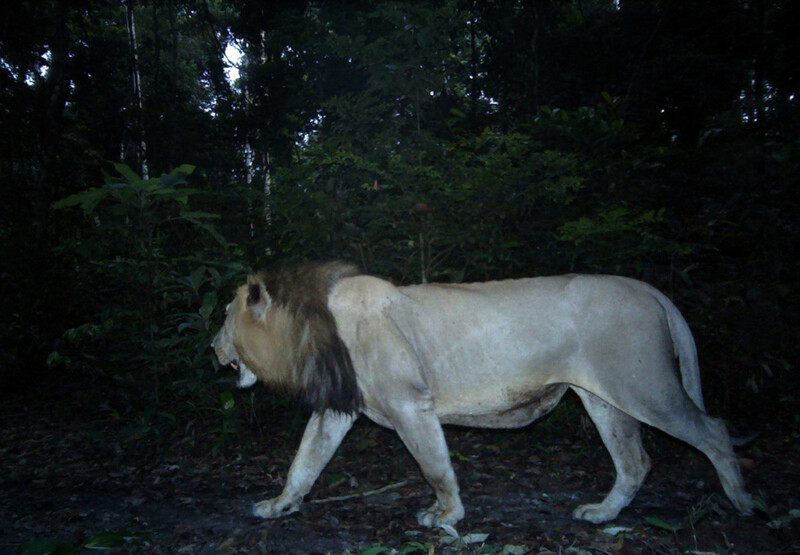 In the meantime, the lion of Gabon walks the forest paths alone—an outlier in so many ways, but a hopeful sign that the remarkable dispersal of the past might happen again. If #CeciltheLion got you mad about big cat trophies, wait until you hear what they’re doing with the bones. 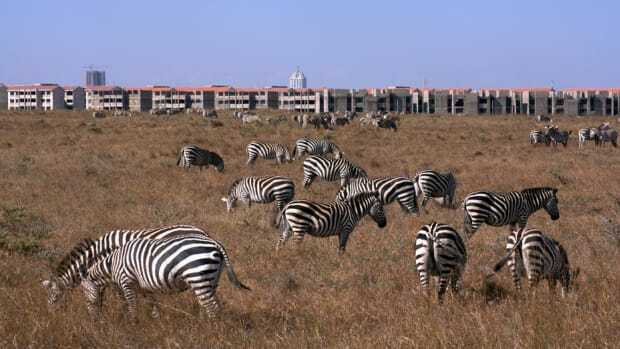 Has Development Turned Nairobi National Park Into a Glorified Zoo? As fences spring up on all sides, a great wildlife reserve morphs into something much less great. A Wonking Class Hero profile of a global environmental innovator. 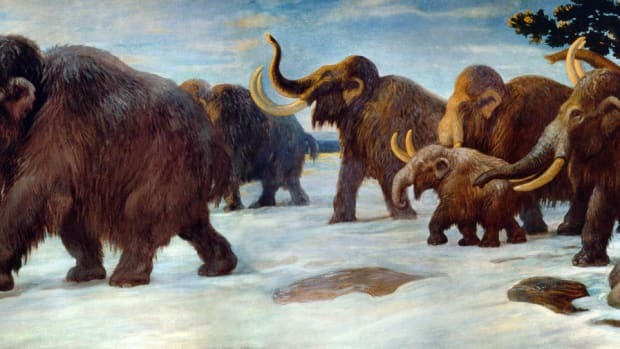 A wave of new research points to a disturbing cause for the woolly mammoth's extinction. Can we prevent ourselves from repeating the same mistake?